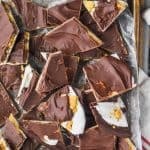 S'mores Chocolate Bark is a yummy, amazing inside out s'mores that you don't even need a camp fire for! Chocolate Bark is my favorite thing to make because it is so easy and the possibilities are endless! Melt 1 1/2 cups chocolate chips and spread the chocolate over a wax lined pan. Be careful not to make it too thin. (I used a 10 by 15 pan and didn't go all the way to the edge.) Place the first layer in the refrigerator for about a half hour. Melt the white chocolate chips in the microwave. Then pour in the marshmallow fluff and microwave for about 30 seconds. Quickly spread the marshmallow layer over the hardened first chocolate layer. Crumble the graham crackers and press them into the marshmallow layer. Refrigerate for 30 minutes. Melt 2 cups of chocolate chips and very gently spread it over the graham cracker layer. Put the bark in the freezer for about two hours. Take it out and break it apart. Keep refrigerated for good and more solid bark. Leave it out for slightly more delicious, but slightly more squishy bark.